Between the two of us we have logged thousands of pitches on ice. We have climbed ice around the globe, from New Zealand to Alaska, Iceland to India, Norway to Nepal and all over North America and the Alps. 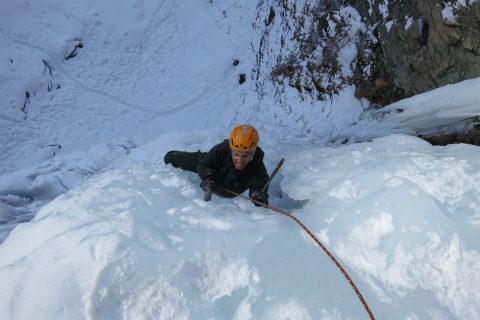 Join us for an introductory ice climbing weekend where you will learn the necessary skills to pursue the sport, or come with previous experience and explore some of the most beautiful frozen landscapes in the world. Every year we climb with clients around Europe and often in North America depending on our schedule. Popular places include: Cogne in Italy, Kandersteg and Arolla in Switzerland, Chamonix, Canada, New Hampshire and Ouray, Colorado. If you are looking for something a little more exotic, consider a trip to Norway or Iceland where you can escape crowds and climb ice just above the sea. If can dream it, we can help you get up it!